As one of our popular prime tours featuring five star deluxe hotels in all cities, China Highlights tour has been our most classic tour featuring all the major cities including Hong Kong and all major historical and cultural attractions in China. In addition, a visit to the amazing Longji Terraced Rice Fields is included in this trip. If you want to see China with all the highlights, this is your right choice! After breakfast, take a departure transfer to the airport for your flight to Shanghai, China’s largest city (home to 16 million people). Shanghai is also China’s principal port on a deep estuary of the Yangtze River. Often regarded as “the Paris of the East,” Shanghai has retained the flavor of its past European influences. Upon arrival in Shanghai, you will be met and transferred to your hotel for check in. Enjoy the rest of the day for leisure, or join in the optional tour of Zhujiajiao Water Village. 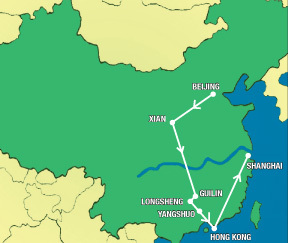 The excursion today takes you to the Bund- a waterfront area that showcases many landmark buildings of western style built in the early 20th century, the bustling Nanjing Road, Chenghuangmiao Old Town, and Tianzifang, an old neighborhood with hidden alleyways full of boutiques and art galleries. You will also visit the well-known Shanghai Museum of Art and History, which ranks among the great museums of the world. You will take late afternoon flight to Guilin, famous for its picturesque limestone peaks and rivers. Upon arrival at the airport in Guilin, you will be met and transferred to your hotel. After breakfast, you will take a day excursion by motor vehicle ride to Longsheng County known for the ethnic minority cultures and the amazing Longji Terraced Rice Fields. You will take a walking tour of the famous Longji Terraced Rice Fields which are built along the slope winding from the riverside up to the mountain top, giving a spectacular scenery. Longji (Dragon’s Backbone) Terraced Rice Fields received their name because the rice terraces resemble a dragon’s scales, while the summit of the mountain range looks like the backbone of the dragon. After lunch at the restaurant run by the local villagers, you will tour Ping An Village and a local market to experience the local culture of Zhuang ethnic group. Drive back to Guilin in late afternoon. This morning you will take a mortor vehicel ride to Yangshuo, an incredibly beautiful town with its landscape dotted with karst peaks and the Li River winding around it. Upon arrival in Yangshuo, you will take a walking tour and stroll on the Xi Jie (West Street) which has attracted so many foreign tourists that it has been even called the “Global Village”. You will also take a relaxing cruise on the Li River while enjoying the haunting beauty of the mist-wrapped monolithic peaks along the riverbanks. In the afternoon, you may take optional hiking or biking tours if time permits. After dinner, attend optional “ Impression Sister Liu Sanjie” Show in the evening. Stay overnight in Yangshuo. After breakfast, you will take a departure transfer to the train station to board high speed bullet train to Shenzhen, a neighboring city across Hong Kong. Upon arrival at the train station in Shenzhen, you will be picked up and transferred directly to your hotel in Hong Kong, “The Pearl of the Orient”. You may stroll around for leisure or shopping for the rest of the day. Today’s half-day seat-in-coach tour of Hong Kong Island takes you to the Stanley Market, the Aberdeen Fishing Village, Repulse Bay and Victoria Peak for a breathtaking view of the city and its harbor. The rest of the day will be free for you to experience the vibrancy and vitality of urban Hong Kong on your own. Take a departure transfer to the airport for your flight back home. 26 meals: 12 breakfasts, 8 lunches, 6 dinners including Peking duck dinner, dumpling dinner banquet in Xian, and Shanghai cuisine farewell dinner party. The initial airport arrival transfer in Beijing and final airport departure transfer in Hong Kong are not included if your transpacific flight is booked on your own.